Ok, so this is crazy, but I would love to have this! So go here and take a look! My wall vacuum keeps getting broken, and my Kirby gives me a hearnia! Wouldn’t this be great to clean up the messes that Noah makes (although rare…haha) on that massive hardwood floor of mine?! 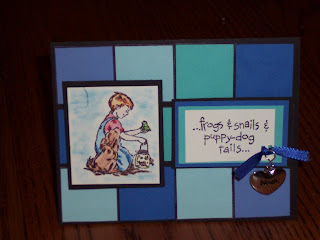 The great site 5 Minutes for Mom is giving one away! Pick me! Pick me! Bar-B-Q and it was a perfect day. I thought it was going to rain, but it didn’t. All of your grandma’s and grandpa’s were there, and your great aunt Mel and Tammie and Great Uncle Danny. 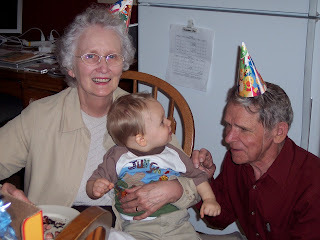 The best thing was that your Great grandpa and grandma got to come too. 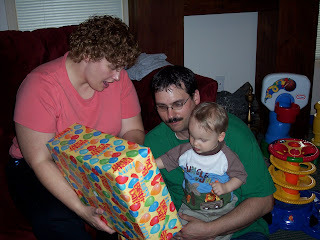 Uncle Nate and Aunt Kari and Landon were there to celebrate. There were so many there to celebrate you, Noah! They love you very much. They even wore party hats for you! You loved your cake. It was so fun to watch you eat it! 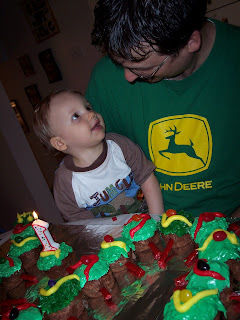 It was a caterpillar cupcake cake so everyone wouldn’t have to eat your mess! 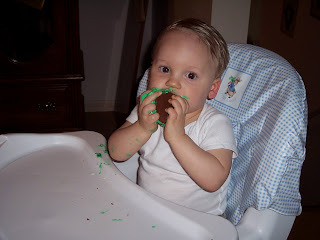 And of course it was chocolate with tons of green icing! My philosophy? The messier the better! 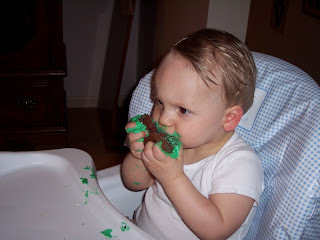 Daddy had to take your fingers and put it in the icing and then into your mouth because you weren’t too sure of it at first. Once you got a taste, though, goodbye cake!!! MMMMM! It was funny because when you realized that everyone was looking at you, you put on the charm and a show! 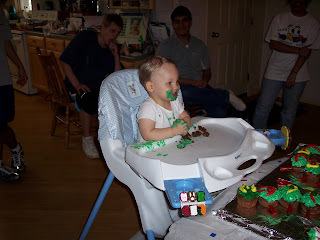 You would put the cake in your mouth, then look at everyone and do it again. You are finally getting the hang of the present thing, too! You liked ripping the paper this time. That was around 10 AM. And then we waited. And napped. And waited. And napped. I can’t believe I slept so much that day! I guess God was resting us up for the LONG night ahead! It was finally time. I think it was about 8 PM. We were all ready, and I started working on getting you here. It went really well. I enjoyed the nurses, and your daddy was the best coach ever. There were a couple of times when he seemed to count too slow…I told him to count faster, I couldn’t hold my breath that long! I was also REALLY hungry. I forgot to eat before I went to my appointment, and so then after we got to the hospital they wouldn’t let me eat anymore! Later in the night I had to have an oxygen mask on. I moaned and yelled “it smells like an ICE CREAM SUNDAE!” The nurses laughed and laughed. I told Daniel to tell someone to go and get me a WHOPPER with CHEESE so I could have it after you were born. Again, the nurses just laughed. I WAS SERIOUS! Well, around 11:00 PM you and I were both getting tired, and nothing was happening. 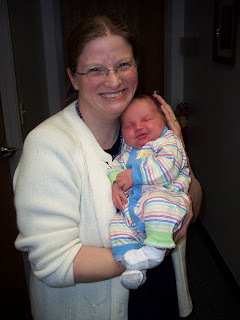 Dr. Mona was so sweet, she had tried so hard to let me do it my way, but you were going to struggle soon, so she came and told me that we were going to have to do an ememrgency C-Section. She assured me that everything was ok, but it was time to switch gears. I cried. I didn’t want to switch gears at all. Then, the unthinkable happend…my “make me feel good” shot started wearing off at the same time, and OH THE PAIN! I think really it was more fear than anything else. It didn’t help that the Dr. giving the epi took FOREVER to come back and change the medicine for it. It also didn’t help that some guy came in and started talking to daddy and I about odd stuff. He had a flannel shirt on, a beard and you could see his chest hair. He started talking to us about the area we live in because he was from there. I was SO confused! Who was this man and why was he talking to me about stuff I didn’t really care about in the middle of labor and WHERE! WAS! MY! PAIN! MEDICINE!? 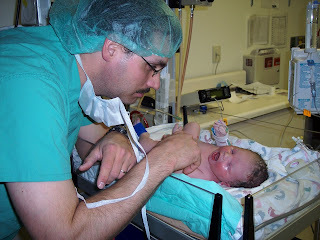 Then daddy went and got all dressed up in cool scrubs and I was wheeled into the Operating Room. It was bright, and I was trying to be calm. I just wanted to see you, and I was soooo tired. 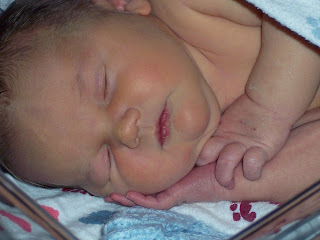 They took my arms and spread them out, which I knew would happen b/c I had watched so many TV shows on births. They don’t tell you about the cold, though! I kept shivering…I guess I had a hard time getting control of the fear. I just wanted you to be OK. Then, there you were, at 11:38PM…not crying, not coming to see me. Daniel was taking pictures and then you finally cried. I heard Dr. Mona talking to daddy about what she was sewing up and he was watching. Then I fell asleep. I was so sad that I didn’t get to see you right then, but I guess I was a little sick myself. 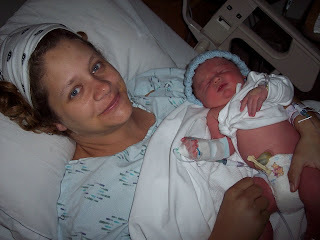 You were 10 pounds and 3.4 ounces and 20 1/2 inches long. At 1:30 AM I woke up in the recovery room. Dr. Mona came in and had done the sweetest thing. She is such a good Dr., Noah. She brought me pictures of you! I just cried, you were so beautiful. She talked about how big you were (the nurses called you Hercules) and what they were doing to take care of you and me, and that daddy was with you, and that you were perfect. 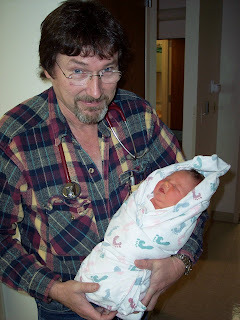 I had to wait a little longer, then they took me to our room, and placed you in my arms. And that’s where we fell asleep. I am telling you, I have the most thoughtful friends! You know, those special LIFETIME friends. I have three great ones that I grew up with. They knew me through the short hair fiasco, the playing with Barbie years (even when we were in our teens…), and the…uh…gas experiences! One of my friends has this great knack for finding those great garage sales…you know, the rich rich houses that have name brand stuff? 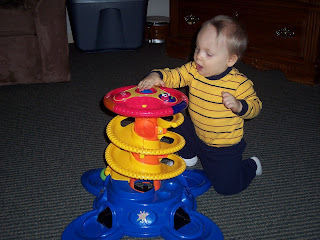 My friend, L, got this for Noah before he could even think about sitting up! He loves it now, it is one of his favorite toys. It was just sweet for her to think of Noah that way. That’s what I mean…LIFETIME friends. Well, this week I had some wonderful tears when I opened a letter from M, and she had handmade this beautiful card for Noah’s birthday. 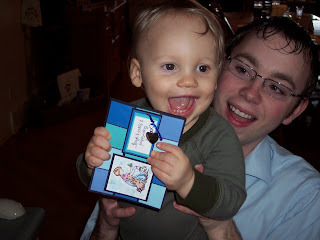 So much time…Noah, I want you to always know you are loved so much not only by mommy and daddy, but by so many others! I have so many memories of this time last year! 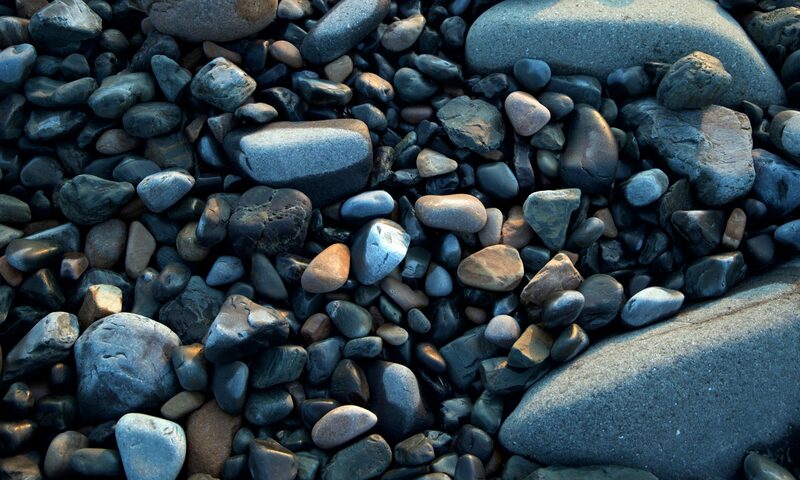 I am quite amazed that I actually remember anything, but it really just seems like yesterday. I.WAS.SO.BIG. Noah had decided that he wanted to come earlier than we wanted, so I was on bed rest. 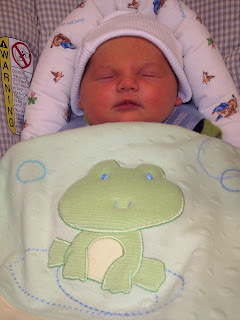 His due date was actually April 12th, but we knew that he was going to come early. I had a goal…make it to March 19th. 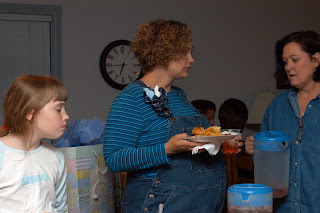 This was the day of Noah’s baby shower, and was the day my doctor was going to be back in town from her vacation. Three weeks earlier I had gone to an appointment, was dialated between a 2 and a 3. I wanted to have him right then, but Dr. Mona wanted me to wait…she was leaving out of town the next day, plus we thought it would be better for Noah to stay until 35 weeks. So, no big deal. I wasn’t having contractions (I thought), so no problem. Well, the next day some things felt…different. I was a little concerned, so we called the nurse and she wanted me to come in. I didn’t want to be one of those that kept coming in for false alarms (we lived an hour away from the hospital), so I just downplayed it. The nurse (I really liked her bluntness)said, well, if you called you must be concerned, I would come in. So we got subs to cover our classes and took off. I was sad and a little worried…I really liked my Dr. and she was on vacation. It WAS really early. I just kind of felt funny, and was worried that I wouldn’t be able to tell what contractions were. He had also not been moving around as much. We got to the hospital in record time, and the little pains kept getting a little worse. Not too bad, but something was going on! We went into the maternity ward (I was very familiar with the nursing staff and the rooms, b/c of a bad triple screen test…had to come in every week and hear Noah’s heartbeat), and Dr. Mona looks up from a chart at us with a very surprised look on her face! We also must have looked just as shocked! God is so good! My Dr. was still there! 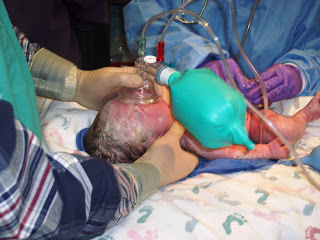 She had to do a quick labor that turned into a long C-section, so hadn’t left yet for her vacation! She asked what I was doing there, thinking I was just there to do some monitoring, then realized why we were there. 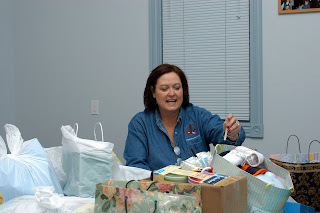 She got us in a room and all hooked up…yes, there were contractions! We waited and waited all day, but in the end she really thought we should wait, and I got a shot. Ohhhh sweet day! I.WAS.OUT. I slept on the way home, slept all afternoon, woke up sometime the next day. Basically, bedrest was the order. I know that most of you would think that bedrest would be boring, maybe even drive you CRAZY. Me, I loved it. I did get bored, but…I got some much needed rest before the BIG DAY! I could still move around, but no laundry, no cooking…hmmm…what was bad about bed rest again? HEHE. The next week was another appointment, different Dr., that was quick. BUT I had started contractions again. Apparently every time we would get in the car to travel, they would start up. This is where my sweet hubby likened me to driving pigs around in a trailer. HMMM. I guess when you want them to have their babies you would drive them around and out comes the little ones. I am still not too sure about how I feel about that statement! This time they gave me pills (ick). They made me feel awful, so I only took them until I knew Dr. Mona would be back in town. The shower was on Monday. So many people came. Everything was so nice. I am still teary-eyed when I think of all of the trouble everyone went to for our Noah. I had a comfy chair, a friend re-covered a rocking chair and ataman for me and brought it so I could put my feet up, and…well…I was just blessed. L made this beautiful ICE CREAM CAKE (mmmm I love!) 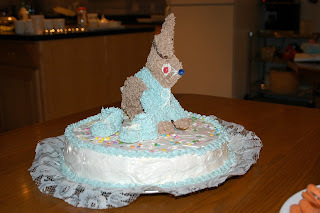 with a Peter Rabbit theme! What work and how sweet. And it tasted to die for. They even passed around a piggy bank and filled it with loose change for Noah…it is on top of his dresser! 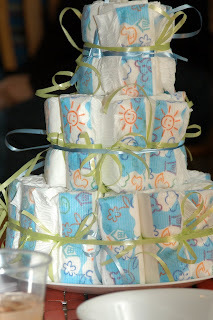 Thank you all of my close friends for making that shower so special. 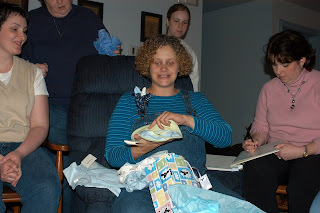 I think it is such a sweet memory for me because all of these friends that were making the shower special I knew were ones that had been praying for Daniel and I for the 6 years we had been wanting a child. They were with me in the hard times and the happy times. Some of them were just as excited as me about being pregnant. 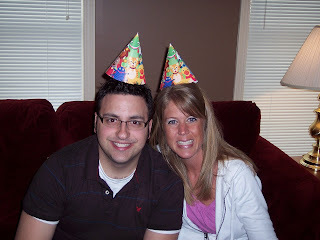 They were truly celebrating God’s gift of this life with Daniel and I. Noah was so loved even before he was here! Oh Jesus thank you for the church you have placed us in! 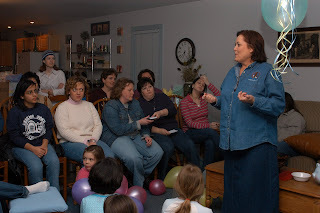 So, here are some pictures of that shower…what fun! 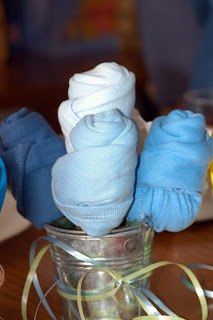 These were the cutest decorations…onzies as flowers (Noah is wearing them now) and a diaper cake! She was so fun! 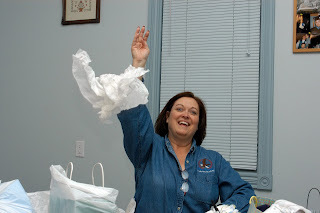 She is tissue saver guru! Thank you so much! First of all, let me say I am sorry. I said I was going to write more, and HA! God laughed at me and said…Really? Believe me, I wanted to write, Noah has done so many things new just this week, but when it came down to it, family and work took over, and then when I did have a “little” free time to write, I was just plain tired and went to bed! So…I will now try to update you on our little family and all that has been happening. First of all, in the work area, we have been working on producing a new promotional video for our ministry. Many meetings, trying to figure out how to say HL is an amazing place, like none other, so telling someone about it is a challenging process. There are so many aspects to what we do here! So many seeds planted. So, that was the name of the video…Sowing Seeds. I have never put together a video on my own…from the very start. Ususally we get in professionals to do the video. Not this time, it is home grown! I have this great guy working with me, and is one of those special workers…you ask him to do something and lo and behold, he does it even better than you imagined. No trying to inspire him to work, no step by step holding hands instruction, just one of those rare people who knows the call of God on his life and follows through…but does ask permission for the things he is supposed to, blah blah blah…I could go on and on. Thank you God, for someone so great like that. So…Not only do we have this great promo we had to do (email me if you want a copy), but we also have started producing our hour long TV show that airs weekly. Some great people in Texas have been helping us out for the past two years (I couldn’t do it all), but God had been really working on me that the show was needing to come back to us and we were supposed to do it. So, after a lot of prayer, that great worker I was talking about earlier moving here and many of our church saying…it’s just not quite like HL, it was time. Boy…what a work it is! Well, we now have 2 completed shows under our belt, are getting ahead in the producing process, and getting our legs underneath us, I feel like it’s going to work. The show has turned out great, it is REALLY good, and I really think God is going to bless it. Isn’t it funny how He really works it out in HIS timing!!??? I had wanted to do the TV show again for a little over a year, but it never seemed to work out. I think it would have been a bad thing a year ago, but now?…can you believe it almost seems easy? Some stress, but not NEAR what it used to be! By the way, when you edit, you basically need to think that every minute that you edit takes roughly about one hour to actually do. So…a 60 minute show? About 60 hours. Could take less, could take more. You have to also go out and tape interviews, set up for that and all of that nonsense…that is what is taking us the most time, really. It’s working, though! Ok, so how does all of that work with Noah and the family? Well, Daniel has been amazing. For the promotional video I put in a lot of overtime, sometimes all night, so that right there I am blessed to have a husband that takes over the household stuff. I was a basket case most of the time, b/c I missed everyone so much. I just had to keep saying to myself…”self, this too shall pass, and it won’t happen again…” So, it passed, we are proud, and it is over! Now there is more of a routine, I spend the mornings with Noah after I teach band and then at lunch I work while he eats lunch and naps at our ministry’s day care a couple of days a week. I feel much better about that! I have to tell you this one before I forget! There is the cutest, sweetest little girl in day care with Noah that is about 3 months older than he is, but I don’t know, 20 pounds lighter than he is (yeah, yeah, exaggeration, I know). Anyhow, they were playing on the floor while I was talking to Miss G. and Little Miss picked up Noah’s pacifier and held onto it. He saw her do that, and said (and I quote) “blaui baba dada uhh…” Obviously it meant, “Little Miss, please give me my paci back.” Well, she just looked at him and said “nope.” Plain as day…they were having a conversation! I said, “little miss, Noah asked for his pacifier back…do you want to give it too him?” “Nope.” She says, and runs off away b/c now Noah is going to case her. SOOOO funny. I love that it was just short and cute and to the point in this little tiny voice! Monday March 5th: Mission’s Conference at church. Like revival, very tiring, but good to serve. 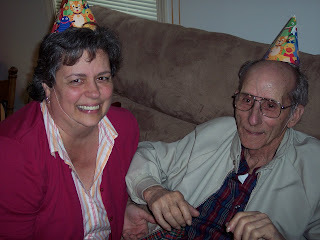 Tuesday March 6th: Daddy’s B-day! Whoo Hoo! Mommy got daddy a recliner! 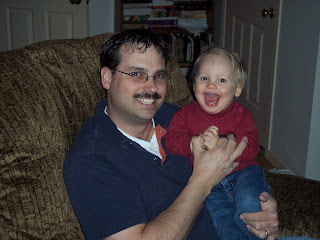 Noah is looking forward to many times being rocked on daddy’s lap in it! At lunch Noah was eating and I was playing with him and winking. He imitated me! SOOO CUTE. He squinted both eyes and smiled soooo big. What a tease. Then he did his famous spitting/zerbert move. All mine, he is, all mine. Wednesday March 7th: Still Missions conference…we are all dead. Happy and blessed, but dead. This week has been amazing in the learning aspects of Noah, though. I have been working hard to get him to say “mama” but to no avail. I think he does it on purpose! Well, we have a visting friend who is a month younger than Noah and she was sitting in the high chair at the day care while her mommy was feeding her, just babbling away. Mamamamama and nanananana were her favorite words. 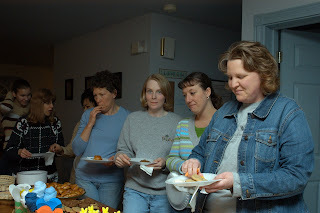 Later that night at supper, Noah pops up with “mamamamama!” I turned and looked at the kids…they immediately said…”He said mamamama!” We partied. He still only does it rarely, but it is so fun. He also is a huge talker now. (Uh oh, not only has he inherited my temper, he has inherited my talking too? Lord help him!) 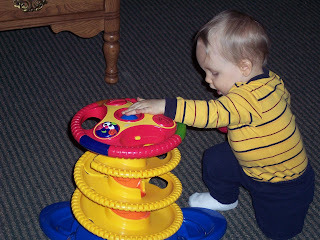 He just plays and babbles all day long! So cute. Thursday March 8th: Missions conference is over. BEAUTIFUL day outside…spring is finally coming! We went to the farm to start getting everying cleaned up and moved around. Noah came, too! While I was feeding him supper in the car, he looked at me, grabbed his blanket and pulled it over his head and then brought it down really quick, grunting with a smile! Oh My! Peek a boo! He did it again, covering his eyes. I asked “where’s Noah? ?” He brought down the blanket quick and squealed. “There he is!” I squealed back. I promise you I laughed and laughed and laughed. Then laughed more, because he got honestly tickled and laughed with me. Who knew you could have so much fun with an almost one year old!? It was like we were sharing a secret conversation or something. We just played and played, and laughed and laughed. I am blessed. Friday March 9th: This is the 11 year anniversary of Daniel and I meeting at a mutual friend’s wedding! WOW, has the time flown by. How fun to think back…the manners, the interrogation from his friends. Saturday March 10th: What a fun day. We drove to somewhere in another state to buy rabbits from this wonderful older couple. I have some kids that are really into 4H rabbits, so we went to get some new rabbits, and took Noah with us. What fun! He really is a great traveler! It was perfect timing, b/c when we drove it was nap time. We learned a lot, and it was so great b/c there was a park right there so we cold eat lunch on the perfect sun shiny day! 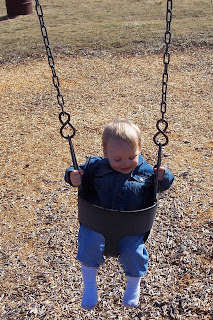 The kids played, ate, and Noah had his first swing! He didn’t like it too much, though. He did like me holding him on the swing! 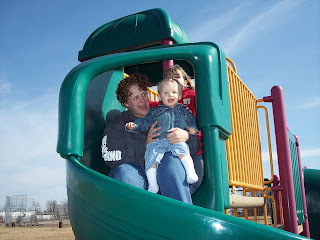 He wasn’t too fond of the slide, either. Well, now it’s Sunday, and it has taken me most of the afternoon to catch everyone up on what has been going on! Daylight savings…hmm…it has kind of messed with Noah and his schedule a bit. I can’t wait to spend the time outside in the sun for the extra hour! 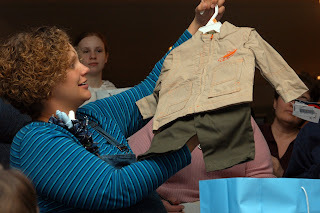 Just a normal busy day,though, I put a pair of overall’s on Noah that are actually toooo small for him…guess it’s time to clean out the closet AGAIN and buy another tote to pack all of the too small stuff away AGAIN. He just keeps growing! 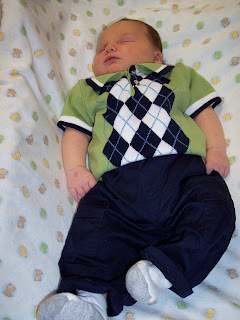 Thank you Jesus for a growing healthy boy, but man, I only clean my closet out twice a year! I feel I am constantly packing up stuff Noah has grown out of! Birthday plans are under way! The cake has been chosen, I can’t wake to make it, the decorations have been picked out, and the invitations have been sent out! I think we have finally chosen the gifts (there are so many I want to get him!). Isn’t it so funny all of the planning we do that he won’t even notice! 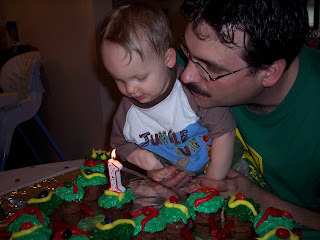 Basically I am a little teary-eyed leading up to the first year birthday. 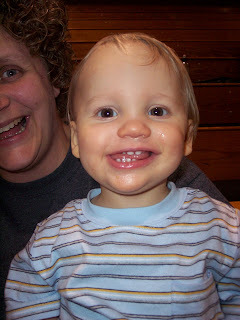 There are days I just wish he would stay at this age…so sweet, so fun. I miss the little one that wasn’t so little. I can’t believe it has almost been a year! In the next couple of weeks I will be talking about the days leading up to Noah’s birth, since I don’t have it written down in this blog yet! Did you know you can make this a book!? What a great baby book! Love you all! Hope you had fun with the update!